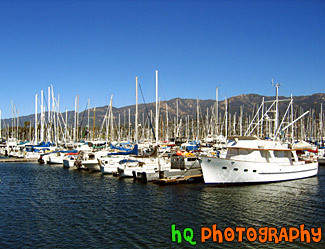 #263 — This is a photo taken of the many boats and sailboats parked in front of the ocean on the shore of Santa Barbara located in Southern California. This photo was taken on a beautiful sunny day and you can see the Santa Barbara mountains in the background behind the boats. 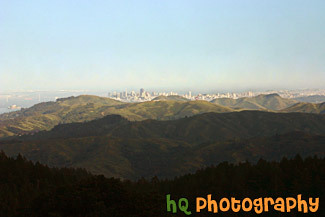 #433 — A scenic picture taken of the city of San Francisco from a distance at Mt. Tamalpais State Park in Marin County. From this picture you can see the tops of the tall buildings in San Franicso cover the green hills as well as the very tip of the Golden Gate Bridge. Alcatraz and the Bay Bridge is also visible in this photo. Mt. Tamalpais is located just north of San Francisco's Golden Gate and is 6,300 acres of redwood groves and oak woodlands with a spectacular view from the 2,571-foot peak (which is where this was taken). With the Gold Rush of 1849, San Francisco grew and more people began to use Mount Tamalpais for recreation. Trails were developed and a wagon road was built. 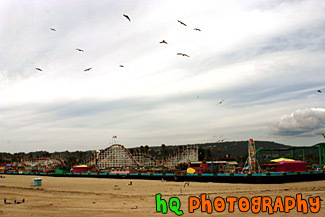 #719 — A scenic picture taken of the Santa Cruz Boardwalk taken from the beach looking in. The Santa Cruz Boardwalk is located on a mile-long beach between Monterey and San Francisco. The Santa Cruz Beach Boardwalk is an admission-free hot spot for beach fun and classic rides! It is California's oldest amusement park and a State Historic Landmark. The two National Historic Landmarks are: the 1911 Looff Carousel and the 1924 Giant Dipper roller coaster. 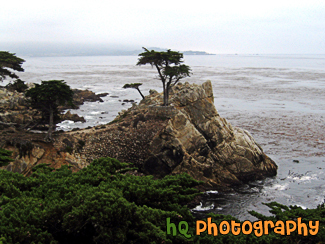 #256 — A scenic photo of the Lone Cypress located in Pebble Beach, California. As one of California's most enduring landmarks, The Lone Cypress has prevailed on its rocky perch for over 250 years. This icon of fortitude has inspired many and is revered as the eternal symbol of Pebble Beach Company. 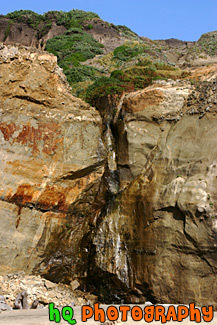 #512 — A scenic picture taken of a big rock cliff with water streaming down located on the beach in Marin County, California. This picture was taken at Kehoe Beach. #2107 — A scenic picture taken of the city of Sausalito, California on a sunny, blue sky day. 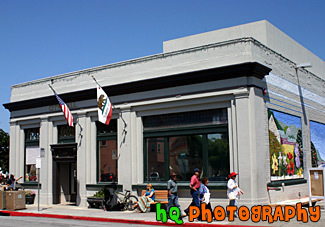 #474 — A picture taken of the City Hall located in downtown Half Moon Bay, California. Half Moon Bay is located on the Coast of California just north of Santa Cruz and northwest of Palo Alto. Half Moon Bay is a great place for everyone to visit because it contains fresh air, scenic country roads, ocean panoramic views, golf courses & a driving range, deep sea fishing, whale watching, surfing, horseback riding on the beach, fields of glorious flowers, vegetables, pumpkins, and Christmas trees, marvelous restaurants, and superb hotels and inns. 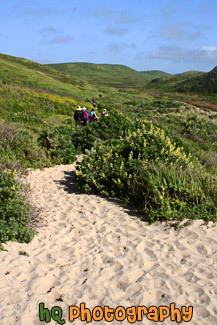 #420 — A scenic picture of some people hiking back to their cars after spending some time at the beach at Kehoe Beach, California which is near Point Reyes in Marin County. Marin County is a county located in California's San Francisco Bay Area across the Golden Gate Bridge fom San Franicsco. 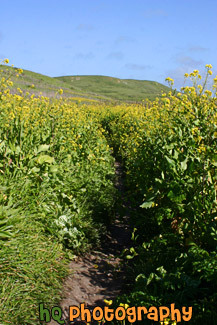 #421 — A scenic picture of a hiking trail in Marin County, California near the coast at Kehoe Beach. Marin County is a county located in California's San Francisco Bay Area across the Golden Gate Bridge fom San Franicsco. 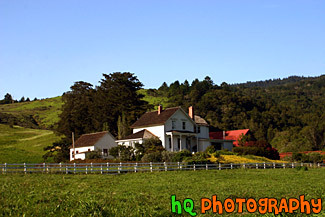 #545 — A scenic picture taken of a house / farm with green fields surrounding it in Marin County, California. 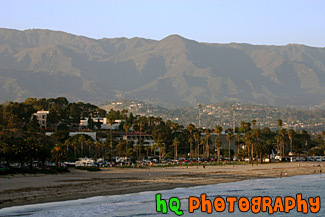 #275 — This is a scenic photo taken at the beach of Santa Barbara, California. In this photo you can see the people enjoying life on this sunny day at the beach. There are fishermen, dogs, and kids having a great time on the coast of the Pacific Ocean! 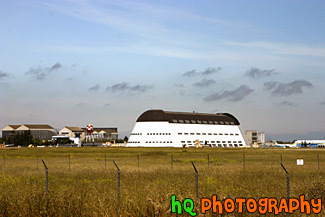 #513 — A scenic picture taken of Lockheed Martin which is located in Sunnyvale, California. Lockheed Martin Corporation was formed in March 1995 with the merger of two of the world's premier technology companies, Lockheed Corporation and Martin Marietta Corporation. In 1996, Lockheed Martin completed its strategic combination with the defense electronics and systems integration businesses of Loral. 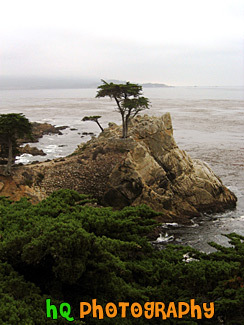 #261 — A scenic photo of the Lone Cypress located in Pebble Beach, California. As one of California's most enduring landmarks, The Lone Cypress has prevailed on its rocky perch for over 250 years. This icon of fortitude has inspired many and is revered as the eternal symbol of Pebble Beach Company. #803 — A scenic picture taken of the Tomales Bay near Point Reyes in Marin County, California. In this picture you can see the hills in the background of marin county and a sail boat parked by this boat launch in the foreground. Tomales bay is a coastal estuary located on the central California coast approximately 40 miles northwest of San Francisco. #806 — A scenic picture of a beautiful hiking trail located by the coast in Marin County, California at Kehoe Beach. 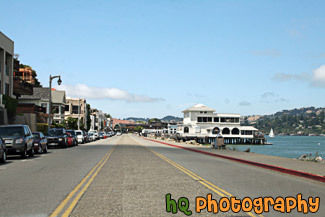 Marin County is a county located in California's San Francisco Bay Area across the Golden Gate Bridge fom San Franicsco. 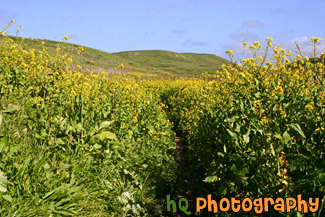 In this picture you can see Marin county's beautiful green hills along with the yellow falselupine wildflowers. 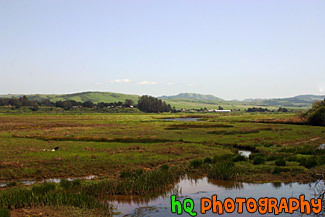 #948 — A scenic picture taken of the grasslands and hills in Marin County, California. This photo was taken near Point Reyes. 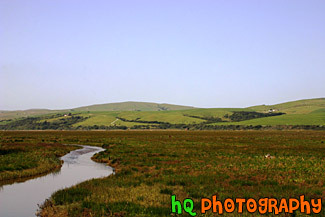 In the photo you can see a stream of water along with the green hills in the background and green grassy field in the foreground. This photo was taken on a beautiful sunny day with blue sky seen all around. 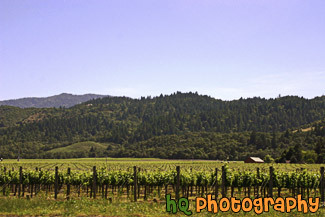 #478 — A picture taken of a Napa Valley Vineyard called Cakebread Cellars. The Cakebread family, owners of Cakebread Cellars in Rutherford, is among the most creative and successful winery families in California's famed Napa Valley. Since its founding in 1973, the winery has developed a reputation for producing world-class wines. Its success is built on quality, consistency and continuity, characteristics which apply equally to the grapes, the wines, the people and the operation of the winery. Napa Valley is known for their wines... There are the 300-plus opportunities to taste some of the world's best wines. Nearly 60% of California's wineries are located in Napa and the parallel Sonoma Valley, together the traditional heart of California's "Wine Country". #479 — A scenic picture taken of a Napa Valley, California Vineyard. 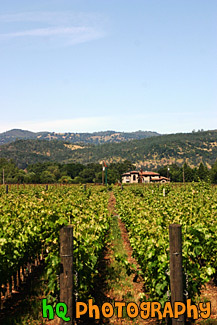 Napa Valley is located northeast of San Francisco. Napa Valley is known for their wines... There are the 300-plus opportunities to taste some of the world's best wines. Nearly 60% of California's wineries are located in Napa and the parallel Sonoma Valley, together the traditional heart of California's "Wine Country". 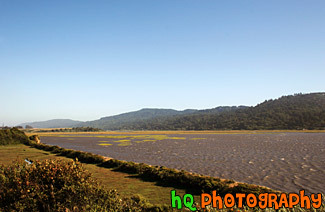 #365 — A scenic picture taken in Point Reyes, California in Marin County. Point Reyes is home to many native land mammals which number about 37 species. Marine mammals also add to this total by another 12 species. The biological diversity stems from a favorable location in the middle of California and the natural occurrence of many distinct habitats which makes Point Reyes a fun place to visit. 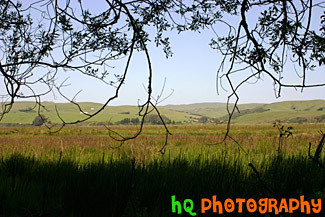 #501 — A scenic picture taken of a Point Reyes landscape scene in Marin County, Califorina. Point Reyes is home to many native land mammals which number about 37 species. Marine mammals also add to this total by another 12 species. The biological diversity stems from a favorable location in the middle of California and the natural occurrence of many distinct habitats which makes Point Reyes a fun place to visit. #752 — A scenic picture taken of Santa Barbara, California along the beach with a view of the many palm trees along the coast and the mountains in the background on a sunny day. In front of the mountain you can see the little hills filled with houses of the rich and famous. 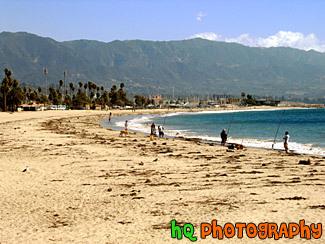 #495 — A scenic picture of the beach and waterfront of Santa Barbara, California. Santa Barbara is filled with beautiful beaches, majestic mountains and a colorful culture that make Santa Barbara a premier resort destination. Santa Barbara is located a little more than an hour's drive north from Los Angeles. 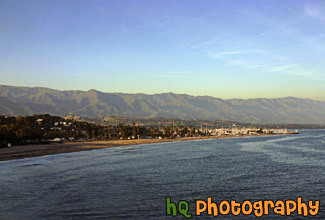 Santa Barbara's harbor is home to the world famous Stearns Wharf; a great destination for the entire family. The zoological gardens are known as a great family day-trip. From the City, you are just minutes away from the Santa Barbara wine country. Whether you enjoy hiking, fine-dining, water sports, being lazy on the beach, culture, or a great night-life, Santa Barbara has something for you. 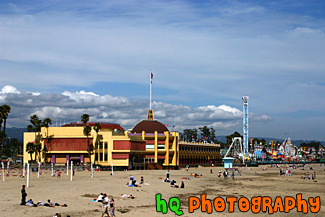 #434 — A scenic picture taken of the Santa Cruz Boardwalk and games from the beach. In this picture you can see all the many seagulls in the sky which surround this beach. The City of Santa Cruz, California, is situated on the northern part of Monterey Bay about 74 miles south of San Francisco and 30 miles from San Jose. Downtown Santa Cruz is a year-round recreation and tourist destination with over 300 days of sunshine per year. It also has many shopping and entertainment opportunities available for all types of people. 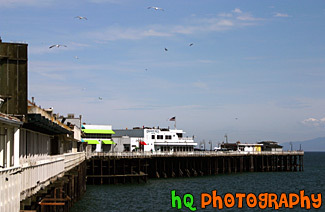 #448 — A scenic picture of Santa Cruz, California's Pier by the ocean. 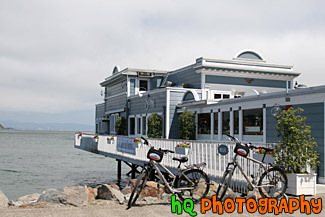 On thie Pier you will find little shops and restaurants along with boat rentals and places to fish. #727 — A scenic picture taken of a Santa Cruz Pier and seagulls flying overhead located in the state of California's by the Pacific ocean. 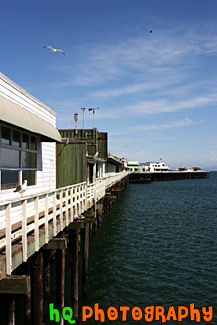 On thie Pier you will find little shops and restaurants along with boat rentals and places to fish. #1582 — A scenic picture taken of a restaurant called Scomas located along the waterfront in Sausalito, California which is right across the Golden Gate Bridge on the Marin County side from San Francisco. #331 — A scenic view of Stanford University taken from a hill up high just behind the campus. 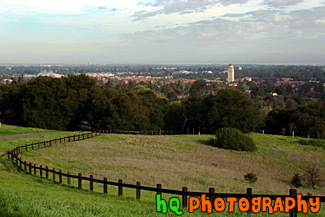 From this picture you can see Hoover Tower amongst all the other scenic buildings of Stanford University. In the foreground there is a wooden fence that curves along the trail. 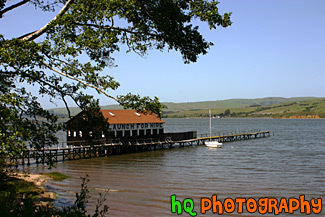 #502 — A scenic picture taken of Tomales Bay located in Marin County, California. Tomales bay is a coastal estuary located on the central California coast approximately 40 miles northwest of San Francisco. Tomales Bay is a vital ecosystem with clean water and diverse wildlife. Residents and visitors cherish its open waters, shoreline, scenic beauty and serenity. People enjoy diverse activities in a landscape that expresses rural and wilderness qualities, and supports limited and sustainable levels of use and development.